The stock investors have lost 11 lk crores in the last two months and the Sensex has lost more than 2600 points !. Looking like a bubble which bursts every now and then, the Indian stock market, like all stock markets, is highly risky. It rose from 3000 to 21000, then fell back to 7000 and then rose again to 21 K. It is now hovering around the 18 K mark and has lost 2600 points since Diwali. Runaway inflation and high food inflation, lack of infrastructure, less agri produce due to climate change, lack of human resources - all these plague the Indian economy. Political instability due to India Shaming ( widespread corruption ) has added fuel to the fire. If Technical Analysis states that all scrips display regular and recurrent patterns of behaviour ( also the Sensex and the Nifty ), then we can say that the coming days are tough for the Indian market. Even though GDP may quadruple and the Sensex may go beyond the 50 K mark in ten years time, now we cannot see a surge in the Sensex or the Nifty for the time being. Ms Gita Gopinath, Professor of Economics at Harvard and hailed as the successor to the Nobel Laureate Amartya Sen, feels that India has to improve infrastructure and human resources to overcome the negative traits in the Indian economy. Food inflation ( 18%) has been brought about by Asian affluence, rising incomes and great demand and less supply. Consumerism is the main causative factor. Agri produce do not go up due to Climate Change. Lack of infra is another factor. We have to do agriculture on lands which lie barren now, increase productivity and yield and improve vital infrastructure like road, rail and inland waterways. The Decoupling Theory is true. Only the BRIC nations have not been much affected by the global meltdown ( Brazil, Russia, India, China ). India still could grow at 9%. Neither the European nations nor the US have escaped from recession. Unemployment also rose in these countries. India and other BRIC nations have not been so affected, mainly because of the governmental controls and a strong domestic market. Controls are less in the developed economies. There is some control on Banks, but not on other financial institutions and they are suffering as a result. Now the US is thinking of brining in controls to save the ailing economy. The dollar is falling now. So is the Euro. Until the dollar stabilises, gold will continue to rise. This is because China is investing in gold, because of their high dollar reserves. In the future, the Indian presence will be felt in the economic field. BRICs will rise in the next ten years. India has the maximum working people in the age group 25-55 years. If India improves infrastructure and human resources, she may well become the third economic power in the world, by 2020 ! Astrologically, even though Jupiter in the 9th augurs well for India, she is running the period of the Sun, who is posited in the 3rd.So let India be on guard ! Sisira Rithu, the hot summer of Kerala ! The sidereal months of Sagittarius and Capricorn constitute Hemanta Rithu. The coldness has not left Kerala. This Hemanta Rithu will be there till the 12th of February. Evening is also characterised by cold winds. The Sun will be transiting Sravana, Alpha Aquilae, initiating Thiruvonam Njattuvela tomorrow. Amongst the six Rithus or seasons, Vasanta ( Medam & Edavam ) is comparitively less hot, Greeshma ( Gemini and Cancer ) and Varsha ( Leo and Virgo ) are rainy seasons, Sarat ( Libra and Scorpio ) is less rainy, Hemanta ( Sagittarius and Capricorn ) is cold and dry and Sisira ( Aquarius & Pisces ) is very hot indeed ! 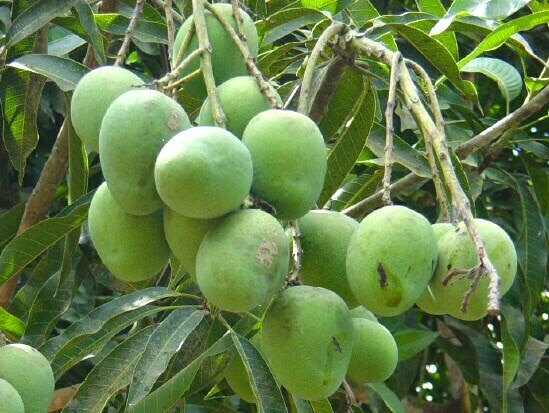 India leads in the production of mangoes. 13.5 million tonnes. China is second at 3.7 million tonnes. Mango is a fruit indigenous to the Indian subcontinet and is the national fruit of India, Pakistan and the Philippines. The word mango is derived from the Malayalam manga . Mango is rich in phytochemicals and nutrients. Also vitamins and minerals. The antioxidant vitamins A, C and E compose 25%, 76% and 9% of the DRI ( Dietary Reference Intake ) in a 165 gms serving. Mangoes also contain Vitamin B6, Vitamin K, B vitamins and other nutrients. Food Inflation is going beyoud the common man's reach. In India, the food inflation has been underestimated at 18.4%. 33 countries have been affected by this phenomenon. Let us analyse what are the causative factors for Food Inflation. So the main causes are more or less man made. Unless we control the global population, control the prices of crude, emit less Green House Gases into the atmosphere, we are in for big trouble. The 4.4% growth recorded by the farm sector is encouraging, but this tempo has to be maintained. India has to feed 1.17 billion people and the world 6.5 billion. There are not enough resources on this planet. The Interlinking of Rivers Project, proposed under the NDA Government has not taken place. The result of this project will be that the income of the farmer will be tenfold - up from 50 dollars per acre to 500 dollars per acre. If done, it will be a mega civil engineering feat. This Project envisages linking all the rivers of India via a Garland Canal and blocking the water from flowing into the sea. There are many rivers which flow into the Arabian Sea and the Bay of Bengal. The water flowing into the Arabian Sea will be blocked and will be diverted to the North. The Garland Canal project can give almost 40 GW of electricity and the farmers will have adequate water. No more farmer suicides. The cost of the Project has been estimated at $ 122 billion. There is criticism by some, saying that India cannot afford such a project. Since everything is interrelated, these factors will affect the stock market as well. We find that the market has fallen from the peak of 21.K !